At the beginning of this year, we set an ambitious goal – to create a simple and convenient training platform for players in competitive games. A number of tools have been created, that allow a player to assess his contribution to the game, to learn the effectiveness of the farm, and to reduce the amount of time spent using hotkeys. 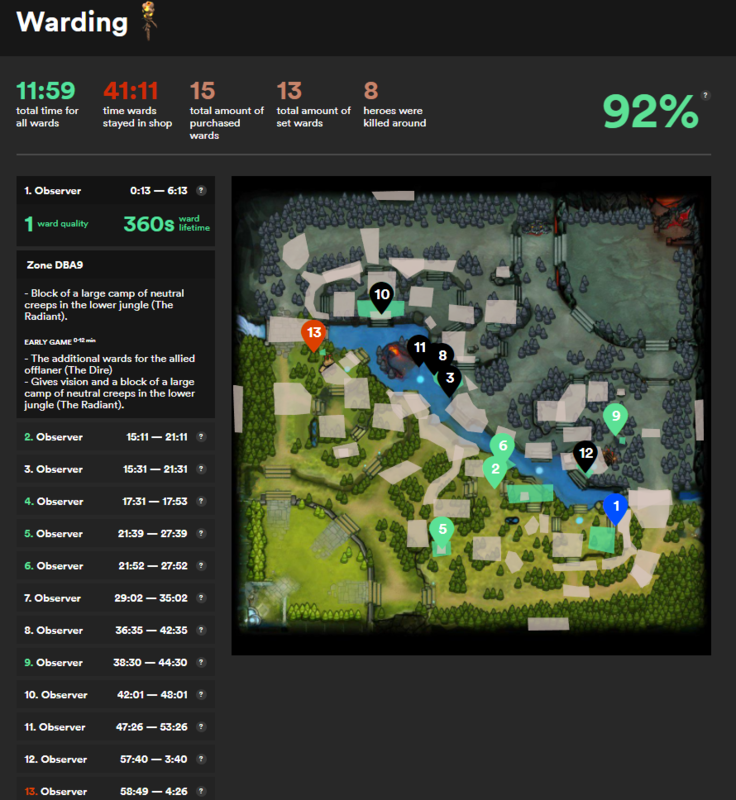 Today, we launch a new block of Ward statistics, which will allow players to analyze the game at an extensive level. The importance of «Wards» in Dota 2 is difficult to overestimate, as the Latin aphorism says – «scientia potentia est» («knowledge is power»). The Information about the enemy's movements unties the hands of your team and provides the opportunity to farm, to split push, to make well-planned ganks, to kill Roshan, etc. We've came to a conclusion to add the important aspect of the game to our platform– Warding. And also to improve the understanding of the optimal zones for «Warding». Were used elements of machine learning to create «Warding» block. We've analyzed all the Wards, that were placed during The International 2017, have excluded, that were redesigned in new patch, and from first tournament, patch 7.07 – AMD SAPPHIRE Dota PIT League, took this data as a basis. The position of Wards placement from the selection of heroes to the appearance of the first creeps, from the first creeps to the initial stage, from the initial stage to the middle stage, from the middle stage to the late stage of the game. The key positions of Wards for different stages of the game were automatically assigned, which allowed to form primary descriptions of each of the zones. Using the resulting clusters as a first approximation, a group of professional players clarified the boundaries of the zones and formed a description that allowed the creation of the «Warding» block in the form in which it is now presented in the analysis. where inSmoke – indicator that takes the value – 1, if the wards are set during the smoke (which provides secrecy of the player, who placed the Ward). placedBeforeDeath and destroyed are similar indicators. It's easy to see that the most common wards that have stood for 6 minutes will have WardPerfomance = 1, but in the worst case WardPerfomance = -2. Further on the basis of this number, we paint the wards in red, white or green colors. Respectively: bad, normal or good. Collect user feedback on areas and their assignments, that will improve descriptions. Evaluation of the utility of wards, depending on the zone and the stage of the game. Keep playing, leave the rest to us.